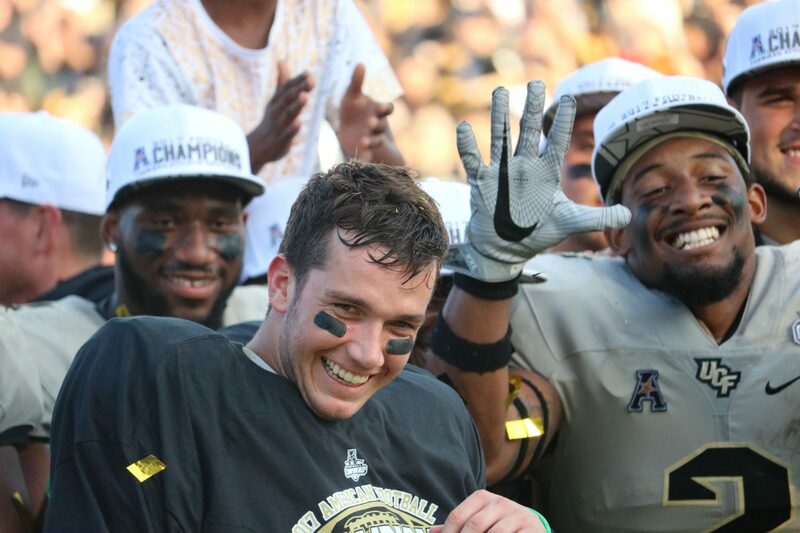 ORLANDO, Fla. – Scott Frost brought a title run to UCF, but the Knights’ third AAC Championship Title belongs to the players. As the confetti rained down on Orlando’s Hometown Team, the trophy jumped from presenter to the team at lightspeed. 51 young men on this undefeated team were a part of the squad that went winless just two seasons ago. 51 young men had to make the transition from blame-shifting to accountable, a shift that has been heralded by seniors and coaching staff alike all season. The winless squad of 2015 wasn’t devoid of talent, clearly. You don’t make history’s most rapid ascent from the bottom of the barrel to the cream of the crop without having some bullets loaded in the chamber, but George O’Leary and staff had let the team become a group of individuals. Frost injected the team with a new sense of swagger and impressed the importance of family on them early on. He added young talent and made sure that they got involved with each other, mixing the old and new classes on UCF football immediately. A 6-7 season to follow up the much-anticipated program revival may have been a small step, but it laid the foundation that carried these Knights through one of the most unpredictable in school history. When 2017 came calling with Hurricane Irma scheduling, College Football Playoff noise, the pressure of an undefeated season and devastating coaching rumors – the foundation of brotherhood from 2016 held strong. Tre and Shaquem were part of the old guard, McKenzie Milton and most of the playmakers in the end zone this season earned their way into the family with their hustle since arriving on campus. The unity shone through in floodlight during the historic undefeated run. There was an understandable lull in practice this week, as the head of the family prepared to depart town. Monday and Tuesday were substandard, forcing Shaquem to call a player’s only meeting, true to his projection as a UCF superhero. In short, the meeting called on the players to look back at one another and keep fighting for their family. To not be distracted by a decision outside of their control and to finish the mission that they had all started twelve weeks ago. The American Athletic Conference Championship could have gone either way, evidenced by the double-overtime finish. UCF could have let it slip away from them, and everyone would have understood, blaming a lack of focus in the meeting room or finding an excuse to pin the loss of the game on the loss of their head coach. A roster of football players kept that from being the headline. With the world in flames around them and the nation’s best scoring offense in the season’s second half breathing down their neck, UCF fired off 65 points on the way to the highest scoring conference title game in NCAA history. Pure heart and hustle won out in that game. The national storylines will be all over the coaching search and the homeward journey of Nebraska’s crowned prince, but this game, this moment and this perfect season belong to the players.